This is where Dropbox comes in. Dropbox is a service which has both free and paid options which not only allows you to share files of any kind, of any size with others it also stores them in the cloud aswell as on your PC or Mac in effect creating a backup of what is already on your computer. The concept is simple, you install the small Dropbox client on your computer and point that client to a single folder, that folder on your computer, just like My Documents on Windows. That folder and all its contents (including sub-directories) will be automatically synced with your account in the cloud. You don’t need to worry about the transfer completing, Dropbox handles that for you, you just drop the file and forget. You can install the Dropbox agent on any of your computers, Mac or Windows, if you have more than one to keep files in sync from one machine to another. But in the digital voice world it makes a perfect solution for sharing audio files with colleagues and even your typist, regardless of whether they are in the same office, same state or even the same country. Dropbox allows you to share certain folders (and even files) with people, so if you store all your important documents in Dropbox on the folders (or files) you choose will be shared with others. For example, lets say you use an outsource transcription service who transcribes your audio files. You can simply setup a “Transcription” folder in Dropbox, share that with your typists and then drop any audio files you need into that directory. You typist will automatically receive the file on their computer and will be alerted via a popup that the file has arrived. Not only that, when the transcription is complete they can just drop the transcript in the same directory and vice versa you receive the actual document into your Dropbox ready for you to read. Most good transcription businesses will utilise their own secure servers for file transfer, however some of the smaller ones still tend to use thrid party sites like sendthisfile.com to move large audio files around. That’s great but you have to wait for the transfer to complete, which if you are working off a mobile 3G connection can be slow and painful. Dropbox takes that pain away and just works, not only that all file transfers are secure and the files are encrypted as they pass from your computer to Dropbox both ways. The uses of Dropbox are limitless. Me personally, I use Dropbox to store all the voice recorder manuals I sell, along with many documents that I refer to often. Aswell as being available for Mac and Windows there is also an Apple iPhone app and Android app so you can access your files while on the go from your smartphone. Dropbox has been around for a while and has really set the standard for file sharing and backup. I wrote this blog because I love the way it works and I use it daily. For file sharing, especially for large audio files, Dropbox is an easy way to move you files around. Dropbox has both free and paid options. The free option gives you 2Gb of cloud storage, if you need more then there are a couple of paid options offering either monthly or yearly payments. 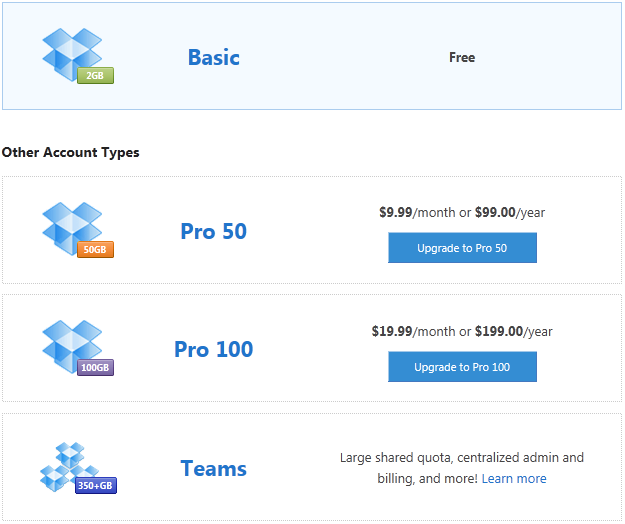 This gives you 50Gb of space called Pro 50 (US$99/year or US$9.99/month), 100Gb of space called Pro 100 (US$199/year or US$19.99/month) and there is also a 350+Gb option called Teams, Dropbox will tailor a plan to your needs. For the average person the free option is the way to go, that’s what I use. So give it a try and let me know what you think. Click here to get Dropbox for free ! I do love dropbox! Especially for my music, it’s so great to have it on hand. I use Maytech.net for my FTP transfers, you should check it out. Yes Dropbox, how did we ever live without it. Thanks for the tip on Maytech also, must remember everyone that has their own website, which is just about everybody nowadays, could/should use that as their FTP server. In fact going one step further FTP should not really be used do to the insecurity of it. Look at transferring all data using SFTP which encrypts the data as it is transferred from client to server. All good web hosts will support this protocol.